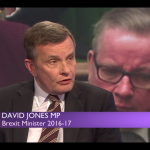 David Jones MP with Jo Coburn discussing the Windrush Generation, the Customs Union, and immigration. The original episode of Daily Politics aired on 26 April 2018. You can watch the full episode here.